1. Burger King: In Far Far Away, it was a Burger Prince. 2. Burger King: Prince Charming orders a Medieval Meal, there's a Burger King-style crown that comes in the meal box. 3. Starbucks: Too many Farbucks. 4. Tower of London Records: Tower Records. 6. Abercrombie & Fitch: Abercrombie and Witch. 7. Old Navy: Old Navery. 8. Gap Kids: Gap Queen. 9. 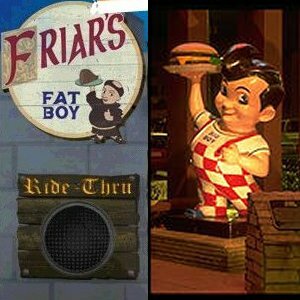 Bob's Big Boy: Friar's Fat Boy. 10. Barney's New York: Barney's Old York. 11. Banana Republic: Banana Kingdom. 12. Sacks Fifth Avenue: Saxxon Fifth Avenue. 13. Stretch Limos: Become stretch carriages. Oversized horse-drawn vehicles that allows the celebrity set in Far Far Away to always arrive in style. 14. Baskin Robins: Baskin Robbinhood 31 Flavors. 15. Hollywood: Far Far Away was obviously based on Hollywood, California with rich and famous houses, palm trees, and even a huge sign over a mountain. 16. Maps to the Stars Homes - In the world of "Shrek 2," you can buy a map to the Fairy Tale Stars Homes. Which will give you exact directions to where Cinderella & Rapunzel's mansions are located. 17. Paramount Studios lot: The entrance to Far Far Away closely resembles this place's entrance. 18. Aaron Spelling's house: The placement of Fiona's parents house is the same placement as the house of Aaron Spelling's house in Beverly Hills. 19. Beverly Hills Sign: Dreamworks Animation actually had to ask Beverly Hills for its permission to spoof that city's all-too-familiar shield shaped sign. Which is why "Shrek 2" actually features an end credit that reads: "The BEVERLY HILLS SHIELF DESIGN is a registered trademark of the City of Beverly Hills." 20. Hollywood Bowl: Look for this historic piece of Southern California architecture to pop up in the background of the Fairy Godmother's big musical number in the Royal Ball sequence.